Breezy sundresses, hanging lifeless in my closet for far too long. Lazy weekends at the pond. Sun hats, bare feet, pedicures. Farm stands and fresh herbs from the garden. Popsicle stains on t-shirts and sticky little faces. The open window above my bed, the breeze that smells of Russian olives and stirs the curtain while I sleep. Chilled Pinot Grigio on the patio as the sun sets and a garden of stars blossom one by one. 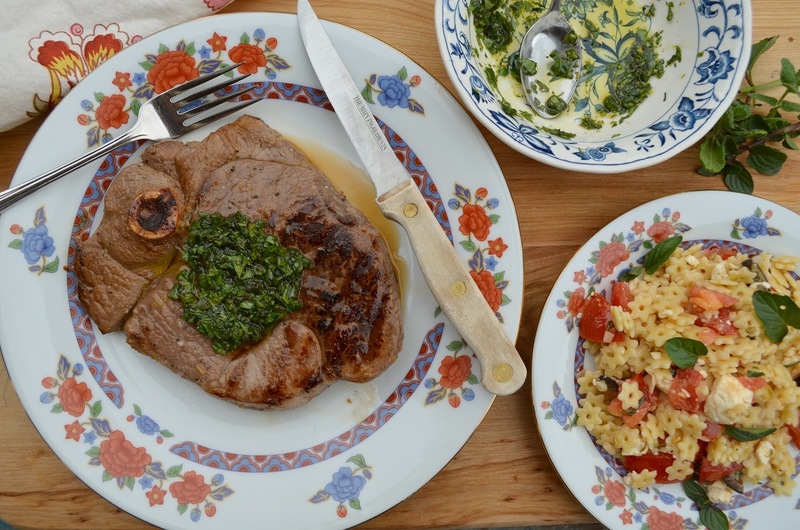 Fresh, easy meals, laced with laughter and garnished with smiles. Food that's just as good cold, served straight from the refrigerator. It finally feels like summer has arrived in Colorado. We're soaking in every drop and falling back into the summer routine. Which means our largest meal is lunch, served outside on the patio in the shade of a huge elm tree. The same tree that lost two branches in February under the weight of winter snow. I worried that we wouldn't have the shade we used to, but the other branches compensate and it's just as comfortable there as always. It doesn't matter that the tree drops leaves into our wine and sticks into our food. We love it anyway. In the evening, when the sun is low, the kids ride their bikes to the park. I tag behind, watching them weave and wobble down the bumpy sidewalk, enjoying the sun on my back and the breeze in my hair. 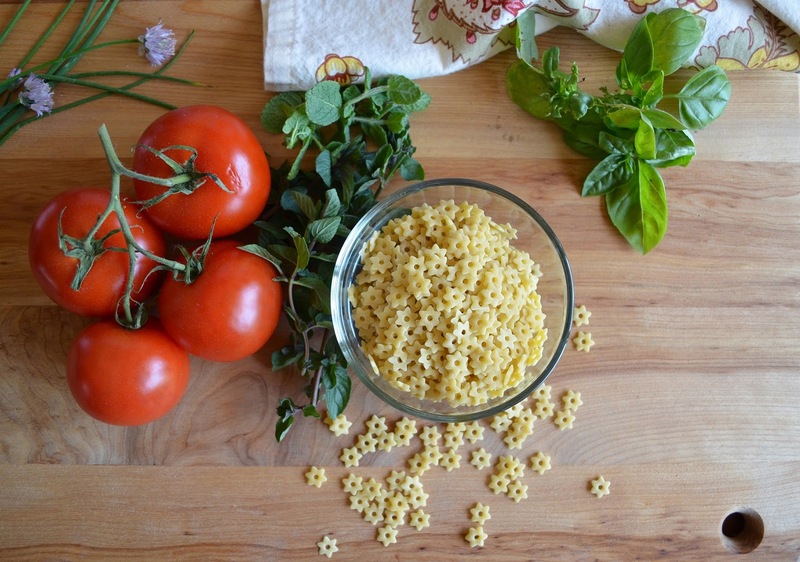 We can't get enough cool soups, pasta salads and fresh garnishes these days. Today's lunch was no different. 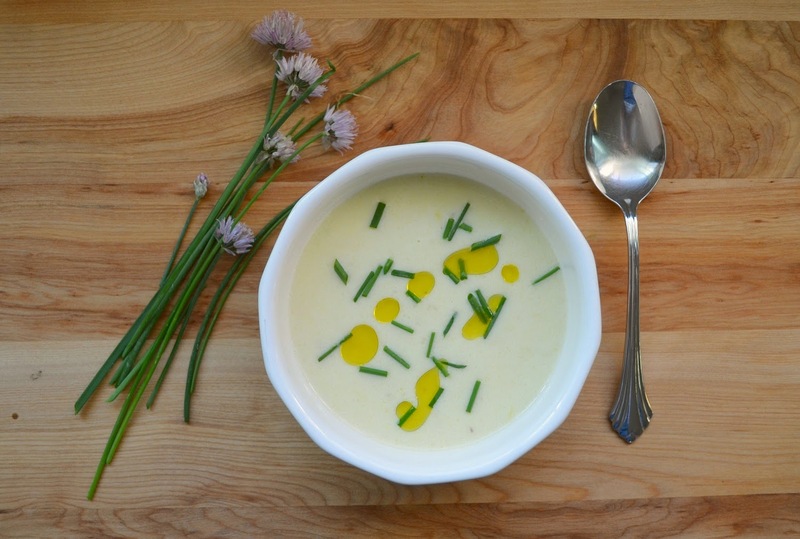 A vichyssoise which I made last night. 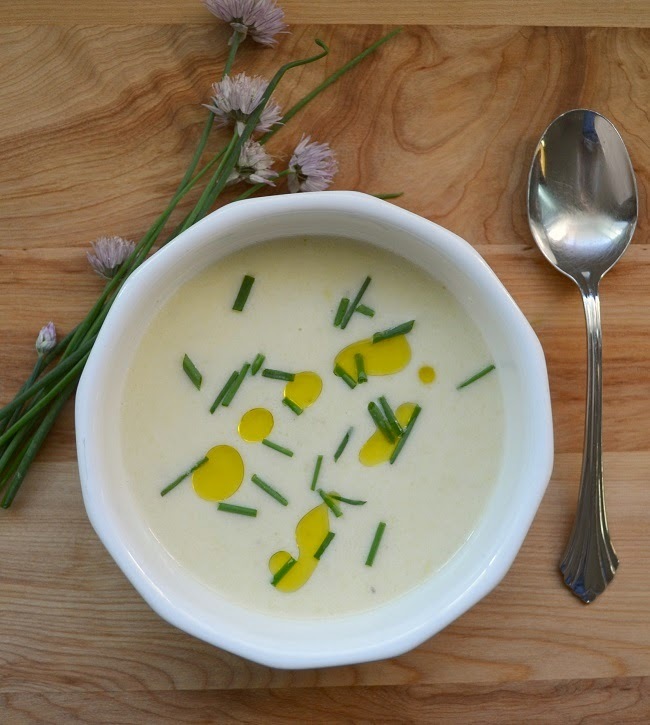 This leek and potato soup gets better with age! I served it cold, along with a cool stelline pasta salad. I'm in love this little star shaped pasta! So festive and fun for summer parties or the Fourth of July! 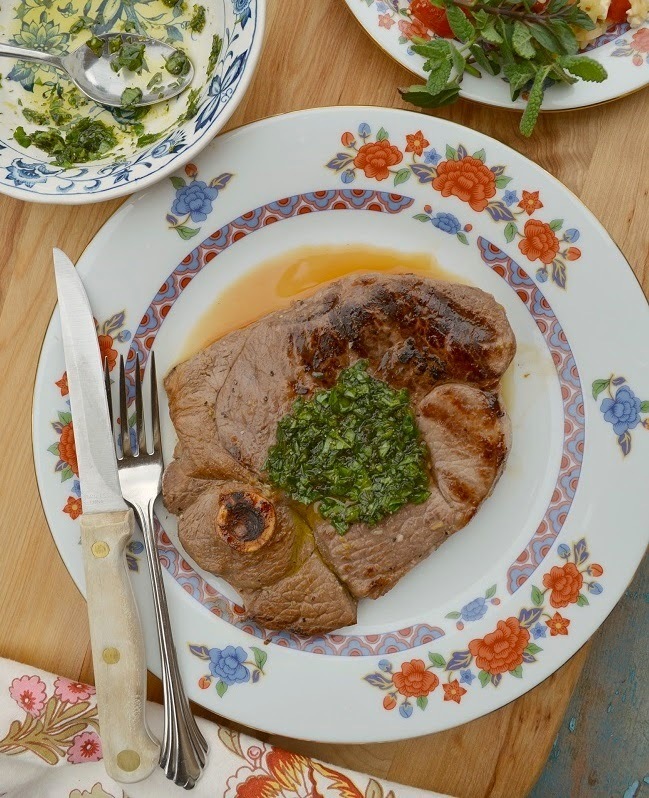 The pièce de résistance was a garlic marinated lamb steak with a basil-mint gremolata. The kids picked the herbs from the garden this morning as I was putting the steaks in the marinade. I cooked the steaks on the grill for just a few minutes when we were ready to eat. It couldn't be simpler than that. Food that's ready when I am. The perfect summer lunch! Armed with a collection of cool, make-ahead recipe ideas, fueled by the inspiration that comes from browsing the overflowing stalls at the farmer's market, I'm ready for the summer routine! I'm ready for a pace of life that moves at the speed I do (slow!). It's been a long time coming, and I'm so ready to welcome summer! In a large soup pot, heat the butter and oil over medium heat. Clean the leeks well by discarding the dark green leaves and chopping the white/light green parts and placing in a large bowl of water. Swish around until clean (do this a couple times). Add the leeks to the pot with a large pinch of salt (approx. 1/2 tsp). Cook stirring occasionally until soft, about 5 minutes. Meanwhile wash the potatoes and cut into 1 inch chunks. Add to the leeks in the pot. Slice the garlic and add to the pot. Stir in the chicken broth, bay leaf, and nutmeg. Bring to a boil. Cover and simmer for 25 minutes. Remove the bay leaf and puree the soup in small batches in the blender until smooth. (Be extremely careful not to blend too much at a time or the blender could overflow causing serious burns!) Alternately, you can run the soup through the fine blade of a food mill. Return the soup to the pot and bring to a simmer. If the soup seems to watery, at this point you can reduce it a bit. Stir in the cream, remove from the heat, adjust seasoning and chill. Garnish with fresh snipped chives just before serving. Serve chilled. To make the marinade, whisk together the olive oil, lemon zest, lemon juice, garlic, sugar, salt and pepper. Place the steaks in a glass dish or resealable plastic bag. Pour the marinade over the meat and place in the fridge. Marinate for several hours, turning occasionally. Preheat the grill on high. Grill the steaks for approx. 4-6 minutes on each side, or until they're cooked to your liking. Remove from the grill and allow to rest a few minutes before slicing. 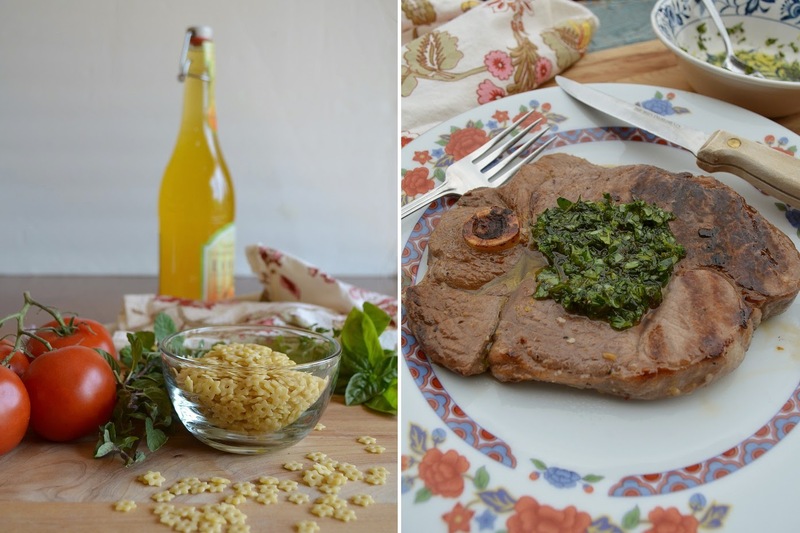 While the steaks are grilling, prepare the gremolata by chopping the basil and mint together with the lemon zest. Place in a bowl and add the olive oil and a pinch of salt and pepper. Stir to combine. Drizzle over the steak just before serving. While the pasta is cooking, place the oil, vinegar, onion, capers, mustard, and salt and pepper (to taste) in a jar. Cover the jar and shake to combine. 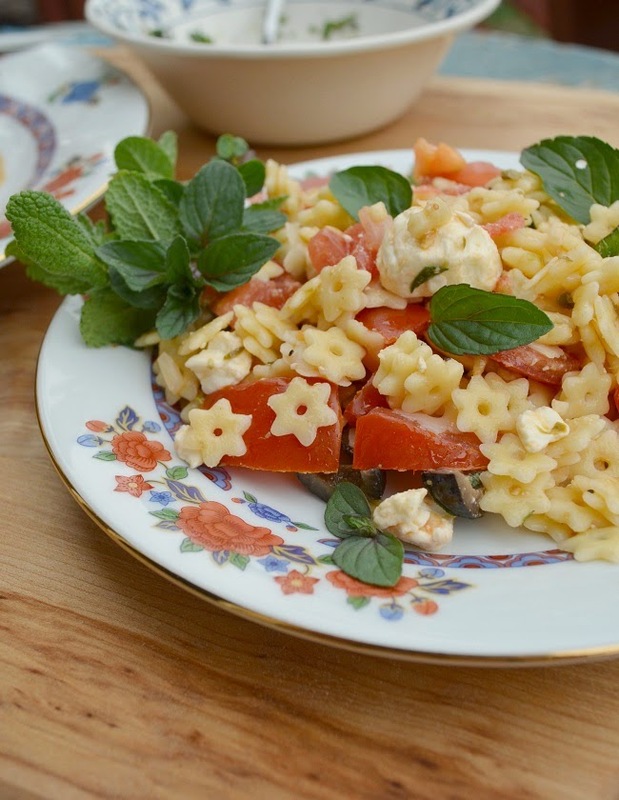 In a large serving bowl, mix the tomatoes, feta, olives, pasta and mint. Pour the dressing over and toss to combine. Serve chilled. Garnish with fresh mint if desired.